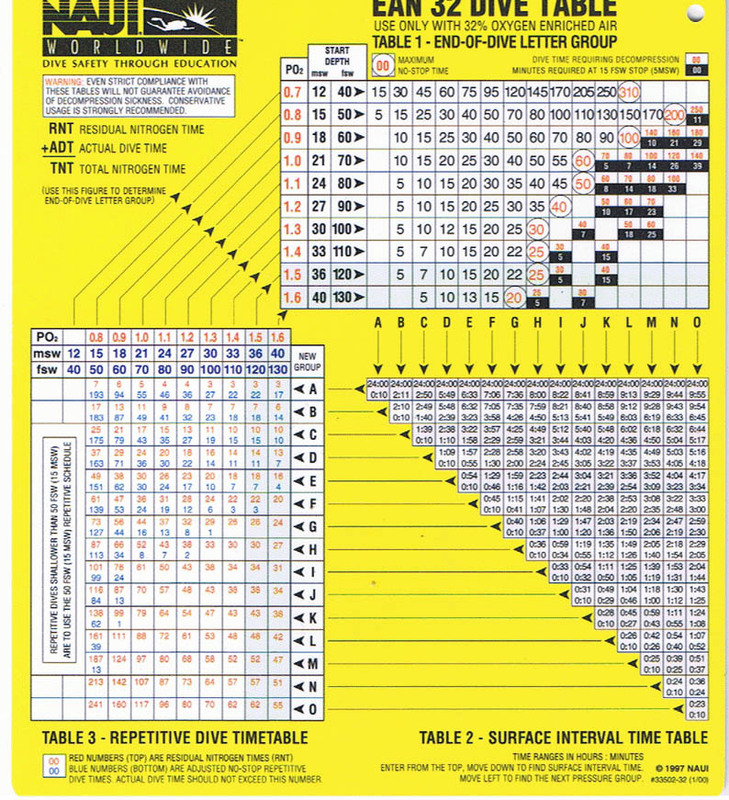 Dive tables are used to determine how long you can safely stay under water at a given depth- both for the initial dive and for subsequent dives. 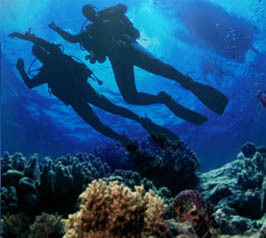 PADI Divers carry the most respected and sought after scuba credentials in the world. No matter where you choose to dive, your PADI scuba certification card will be recognized and accepted. In fact, on most scuba diving adventures you'll be surrounded by other PADI Divers who made the same certification choice you did - to train with the world's largest and most respected scuba diving training organization. With more than 130,000 PADI Professionals and around 5700 PADI Dive Shops and Resorts operating in more than 180 countries and territories, you will likely find a PADI Scuba Instructor who can speak your language and offer you a comfortable learning experience. 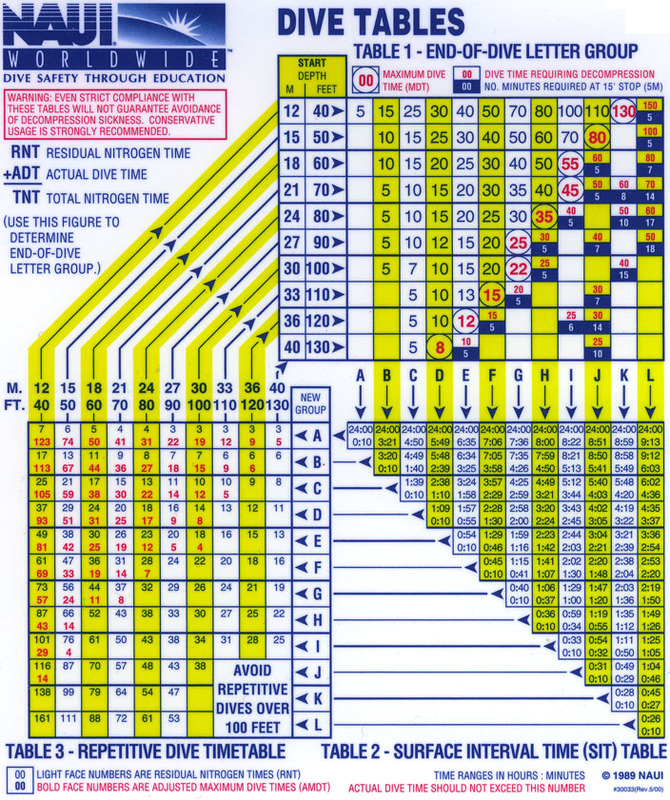 To serve the needs of divers worldwide, translations of PADI materials are available in at least 26 languages. 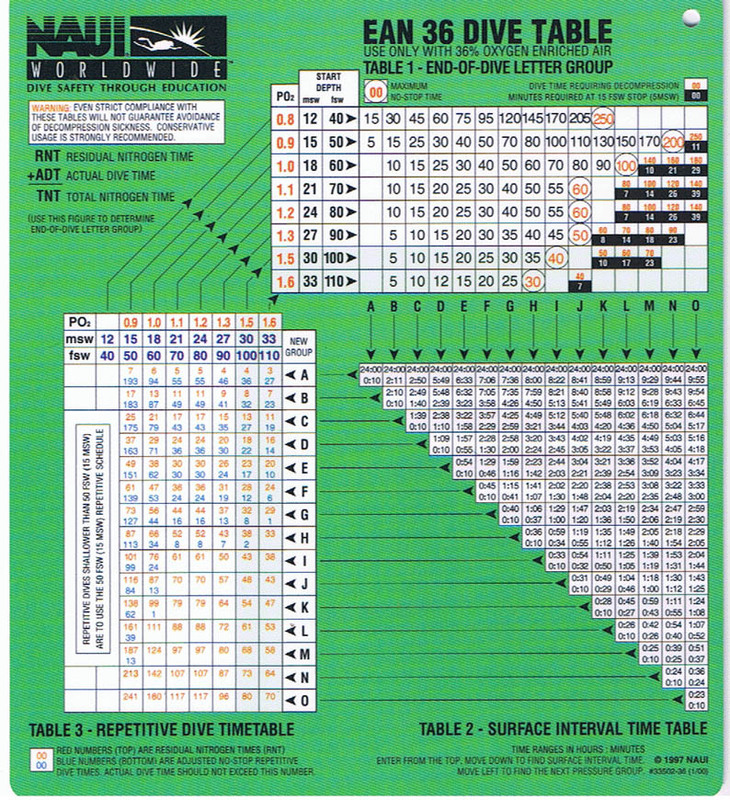 NAUI Worldwide: National Association of Underwater Instructors has been teaching the world to dive safely since 1959. As the largest non-profit and most respected dive training and certifying organization in the world, NAUI offers a full range of training programs from Skin Diver through Instructor Course Director, with dozens of specialty courses including Nitrox and Technical diving. NAUI's global reputation for the best in training and educational products reflects its core values of quality dive training through education. Many organizations specifically choose NAUI for their diver education programs including Walt Disney World Resort in Orlando, Florida, United States Navy SEAL Teams and NASA's Neutral Buoyancy Laboratory in Houston, Texas (USA) where astronauts train for their space walks. 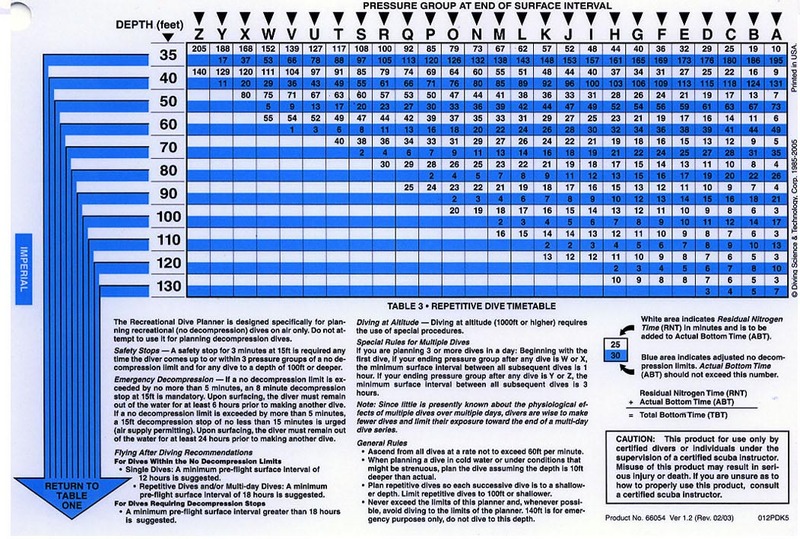 The table below illustrates the impact of Boyle's and Dalton's laws on air pressure and density. 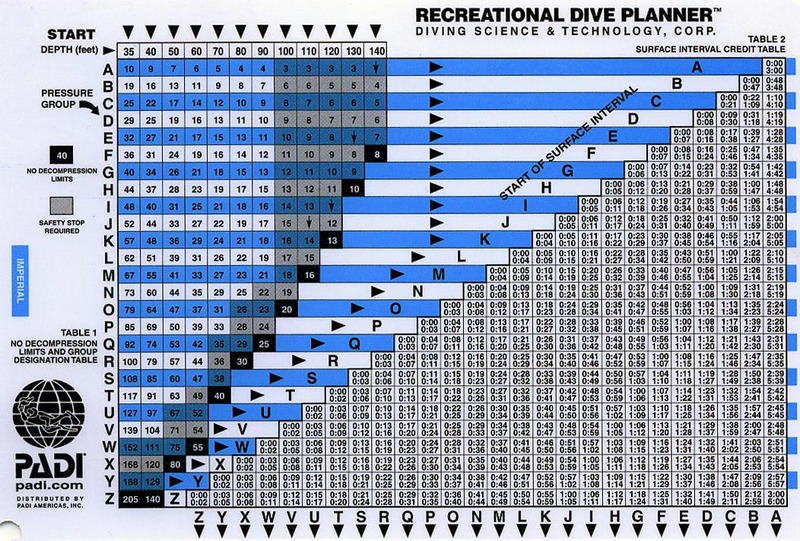 Note that the sport diving limit is around 130 feet. At that depth you're subjected to a total pressure of five atmospheres, and the air in your tank has been compressed to 1/5th of its volume. Which means it only lasts 1/5th as long. And when you look at the partial pressures of Nitrogen and Oxygen as you dive deeper, you can see how Henry's law will make a lot of Nitrogen dissolve into your body tissues.